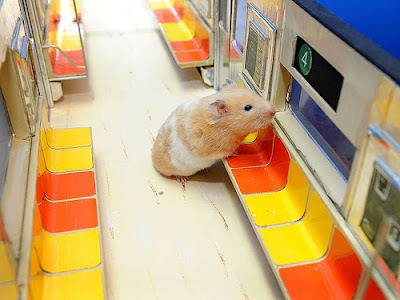 Ananka's Diary: Giant Hamster Roams the NY Subway! YAY first comment! These are definitely interesting pictures. But why make the 'subway' more to scale so that it looks more like the hamster is the size of a human, and not taller? the moment I read the title of this post I started hyperventilating. I'll stop before I start sounding stupid. poor reggie. it was really stupid of him to almost die trying to eat himself though! Whoa...Reggie....I always thought I would do that...but you already proved that it's not safe. I miss my hamster...gone now...in heaven... Hamsters are cute. Keep on keeping us posted on the weird and strange world! be sure to check out all the pages on this site! Oh dear. Snake suicide. D: There are faster, less gruesome ways than eating yourself, Reggie. 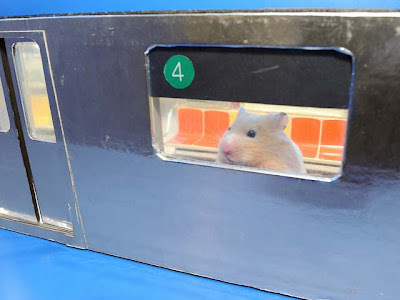 The evidence photographer should be careful where he puts his hamster. Adorable little devil could be planning a subway bombing of his own--they've furnished him with a hands-on planning model. Ha! An actual ouroboros. How cool. my mumsie said we might get another one though! i had a hamster named kiki. I want a hamster!! Well, my friend has a hamster, and every time she tells me to hold it, it bites me! I want a hamster that won't want to be the sorce of my pain! I have decided: the world is out to hurt me!!!!!! As i was innocently trying to sew a present for my younger cousin I was stabbed by a needle!!! and not the one that u poke through the fabric w/, the other one. I know: how awful! then, i tried using a thimble, and u know what happened? there was a HOLE in my thimble!!!!!! and i got poked AGAIN!!!!! so, i abandoned by thimble and was stoically striving for the greater good ( namely finishing the present)and the needle BROKE on me. AAAAAAAAAAAHAHHHHHHHHHHHHHHH!!!!!!!!! it is trying to hurt me.i must nurse my poor fingers now. i wander how much it weights, and who gave birth to it.